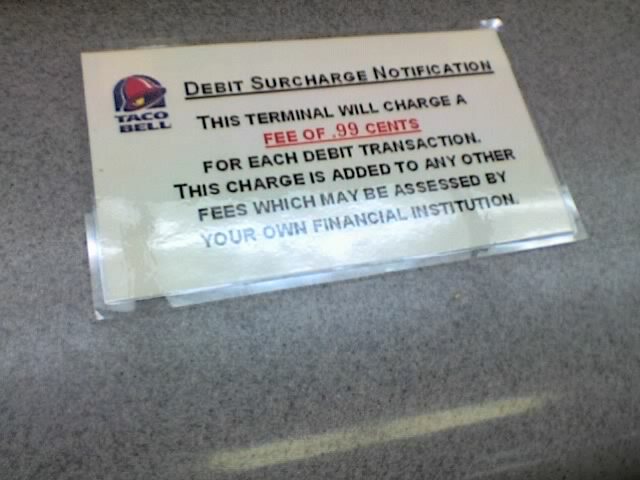 As you can see from the above photo, my local Taco Bell will only charge 0.99 CENTS surcharge! Not even a full cent! Posted in Customer Service, Photography. you mean "not even a full dollar"…because that's a lot of cents…99 cents!! No, as it's written, it says ".99 cents" which could also be written as "0.99 cents" which is less than a whole cent. You're as big an idiot, if not even bigger, than the fool at Taco Bell who put the sign up in the first place. The sign is still there! I checked it today! Perhaps you could politely explain to the restaurant manager that there's a difference between 0.99 of a cent, and 0.99 of a dollar.